Is iTunes Match right for you? Apple’s iTunes Match has been around for more than two years and, other than the addition of the ad-free version of the Pandora-like iTunes Radio, has changed very little. But there are many who remain on the fence. Is access to an online music storage locker worth $25 a year? Does iTunes Radio make it more so? Let’s examine some use cases where iTunes Match will work for you, and others where it won’t. As Apple says, “iTunes determines which songs in your collection are available in the iTunes Store. Any music with a match is automatically added to iCloud for you to listen to anytime, on any device.” And, “since there are more than 26 million songs in the iTunes Store, chances are your music is already in iCloud.” For songs not in your music library, iTunes uploads them to Apple’s servers. I won’t go into the problems here about matches—see this article for more on iTunes Match issues—but, for the most part, iTunes Match does work; it can just be annoying. You have a small library: You have fewer than 25,000 tracks (not counting purchases from the iTunes Store). You want to listen to your music on your mobile device without worrying about syncing it: With iTunes Match, you can download any of your music from the cloud—assuming you have wi-fi access, or a data connection—and listen to anything in your library. You’re not limited to what will fit on your iPhone or iPad. 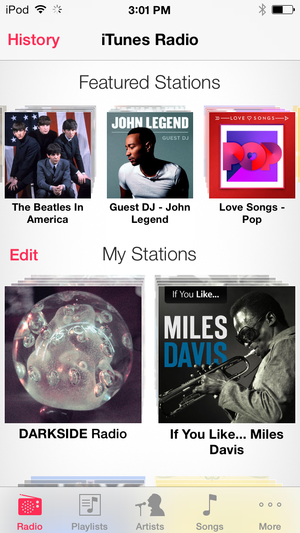 Listen to iTunes Radio without ads, with an iTunes Match subscription. You want to listen to your music on a second computer without worrying about carrying your music files from home: If your boss lets you listen to music you’ll never need to transfer files manually to your work computer. Just sign into your iTunes Match account on your work computer and listen to whatever you want. You and family members want to listen to the same music: Others who you trust with your Apple ID can log in with your account and access your files and playlists. They can do this on an iOS device or a computer. You want to “update” an old music collection ripped at lower bit rates than what iTunes Match offers (256 kbps AAC): iTunes Match will match files that are 96 kbps or higher. You can delete your local files and download the higher-quality files. These files will still be playable if one day you choose to let your subscription expire. You want to listen to iTunes Radio ad-free: For some people, the $25 annual subscription is worth it just to get ad-free iTunes Radio access. But iTunes Match isn't an ideal option for everyone. If you’re in the following situations, it may not be for you. You have a large music library; more than 25,000 tracks (not counting purchases from the iTunes Store): If, when first attempting to match your music collection, you have more than 25,000 tracks, iTunes will refuse to match any of it. If you have fewer tracks that you have matched but then later exceed that number of tracks, iTunes Match will stop matching and uploading new music (though you can still listen to what you’ve matched). 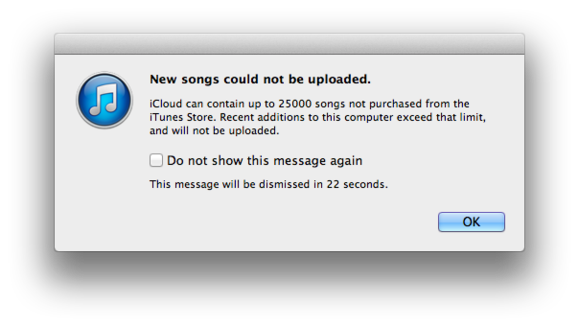 If you hit the iTunes Match limit, you won't be able to upload any more music. You have a data cap on your mobile contract: All those downloads use up data; about 100 MB per hour of music. If you have, say, a 500MB monthly data allowance, a single album could use up 1/5 of your total. You want to listen to music on a mobile device but are often in areas with poor cellphone coverage: Nothing’s more frustrating than wanting to listen to a specific album but not being able to download it because you can’t get 3G (or better) access. If you’re often on the road or work in areas with poor coverage, you might be better off just syncing music to your iPhone from iTunes. You’re not allowed to download files to your work computer: If your boss won’t let you download files—such as if a company security policy prevents you from connecting to iTunes—you’re better off copying your music from a portable hard drive. You use a streaming service, such as Spotify or Pandora for much of your listening, you may not use iTunes Match very much: iTunes Match is for people who want to own their music, though it also makes iTunes Radio ad-free. You have more than five computers or more than ten iOS devices and/or Apple TVs: This is the limit Apple places on devices available to play back matched music per Apple ID. This can be an issue for families, though not many people will hit those limits for a single iTunes Match account. Fortunately, iTunes Match isn’t the only game in town. If you’re hit by the library size limit, you might want to look at Amazon Cloud Player. However, when our reviewer looked at it, he wasn’t impressed as it requires separate applications for importing and playing your music. It does let you store up to 250,000 songs for the same $25-per-year price though. There there’s Google Play Music. While it’s not yet ideal, it does give you unlimited tracks for $10 a month (you get 20,000 tracks for free). However, that’s the same price as a music subscription services such as Rhapsody, Spotify, or Beats Music—services that give you much more music to choose from. Apart from those tracks that seemingly won’t match and metadata that is apparently inconsistent with its counterparts on the iTunes Store, iTunes Match works well if you fit the profile. If you haven’t tried it yet, check your needs and the way you listen to music. It might be worth springing for a subscription to see if it works for you.